If your child’s tooth has come out too soon because of decay or an accident, it is important to maintain the space to prevent future space loss and dental problems when permanent teeth begin to come in. Without the use of a space maintainer, the teeth that surround the open space can shift, impeding the permanent tooth’s eruption. When that happens, the need for orthodontic treatment may become greater. Space maintainers can be made of stainless steel and/or plastic, and can be removable or fixed (cemented to the teeth). A removable space maintainer looks much like a retainer with plastic blocks to fill in where the tooth is missing. If your child is older and can reliably follow directions, a removable space maintainer can be a good option. Fixed space maintainers come in many designs. A band-and-loop maintainer is made of stainless steel wire and held in place by a crown or band on the tooth adjacent to the empty space. The wire is attached to the crown or loop and rests against the side of the tooth on the other end of the space. A lingual arch is used on the lower teeth when the back teeth on both sides of the jaw are lost. A wire is placed on the lingual (tongue) side of the arch and is attached to the tooth in front of the open space on both sides. This prevents the front teeth from shifting backwards into the gap. In the case of a lost second primary molar prior to the eruption of the first permanent molar, a distal shoe may be recommended. Because the first permanent molar has not come in yet, there is no tooth to hold a band-and-loop space maintainer in place. A distal shoe appliance has a metal wire that is inserted slightly under the gum and will prevent the space from closing. There are four general rules for taking care of your child’s appliance. Your child should avoid sticky foods, including candy and chewing gum. Encourage your child not to push or tug on the space maintainer with the fingers or tongue. Keep your child’s space maintainer clean through effective brushing and flossing. 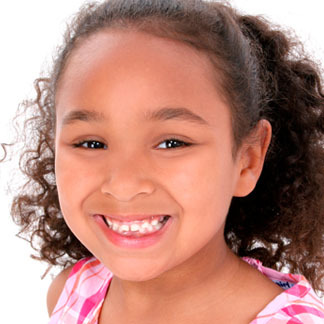 Your child should continue to see the pediatric dentist for regular dental visits.